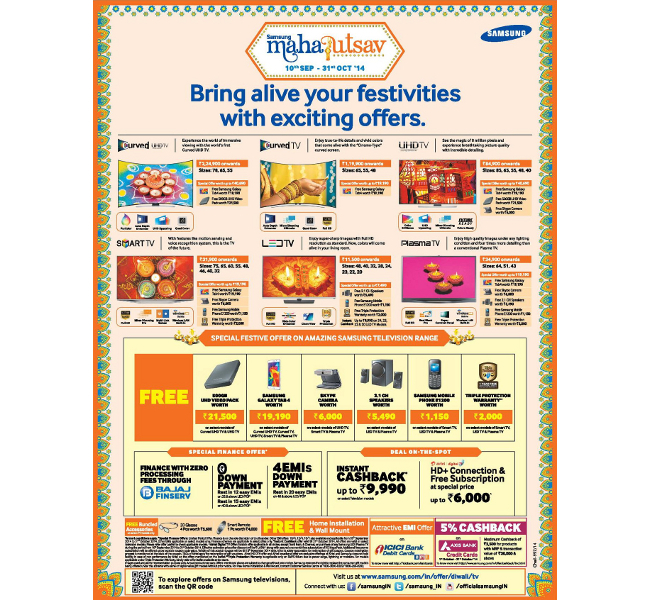 Samsung has brought some exciting offers for the people that are looking to purchase something special one this Diwali. During the festival period of 2014, the firm is celebrating Samsung Mahautsav and announced to vend its impressive LCD & LED Televisions in attractive prices. This multinational conglomerate is providing freebies along with these amazing televisions. By getting your hands on the favorite TV, you will also add some free accessories as well as electronic gadgets in your list. Currently, the company has listed several Ultra high definition televisions for the festive season, where Curved UHD TV is available to buy with Free Samsung Galaxy Tab4 and 500GB UHD Video pack. Here, Samsung UHD TV, Plasma TV, Smart TV and Curved TV are also bundled with Free Galaxy Tab4 of worth Rs. 19,190. To enhance the enthusiasm among the customers for the coming auspicious days, company is also offering some other electronic appliances on its premium quality of TVs. The televisions can also be purchased with Free Skype Camera, Samsung Mobile E1200, 2.1 CH Speakers, Triple Protection Warranty and 2.1 CH Speakers. Notably, these above mentioned tools are procurable with selected model of the televisions, which has been notified in the added image.